Posted On March 13, 2015 by Team iCynosure. I really have no choice when it comes to being stressed. With the multiples roles I play, I never know when the bottled up anxieties reach a limit to give way to stress. Though I don’t have a choice being stressed, I do have a choice in working towards undoing its effect on me physically as well as mentally. After a lot of trial and error, I’ve finally found the magical steps that help me negate the negativity that the stress dragon brings with itself. Usually when I’m stressed; the first thing I do is climb down a flight of stairs and run up. Over a routine of two to five times going up and down, my stress levels definitely show signs of improvement. Not only does it help in relaxing but also is a sure shot boost in my energy levels. One thing that sure puts me in a better mood is clicking pictures. Even research says that even if it’s a forced smile, it helps you handle stress better. So out comes my mobile and I click away to glory, and why not it’s the season of selfies. Pose, smile, click and scare the stress away. When I feel really stressed out, I hit my wardrobe, my work desk and my shoe closet with a vengeance. Rearranging things I want to keep, discarding stuff I haven’t used in a while makes me feel awesome. It not only clears a lot of space in the confined spaces but also helps me give things away to those people who may make use of them. When I realize that none of the first three options are really relaxing me, then I have two aces up my sleeve. One is to sit back in bed, pop the corn and watch one my favorite movies. A movie that I know every dialogue of, remember every scene of and live with the character in the movie. Be it Vivian Ward of Pretty Woman, Princess Ann of Roman Holiday, Holly Golightly of Breakfast At Tiffany’s or Allison Hamilton of The Notebook, these girls reduce me to tears which is a sure-shot way to release my stress. The best way to free myself of all the tension, stress and the build-up negativity is getting a full-body massage. I head straight to the spa, lie down to inhale the aromatic air; feel relaxed with the pressure levied while listening to soothing music in a controlled environment. Who wouldn’t de-stress? And every time I think about these, I remind myself that to enjoy these I need not be stressed, I can enjoy this even when relaxed and happy. 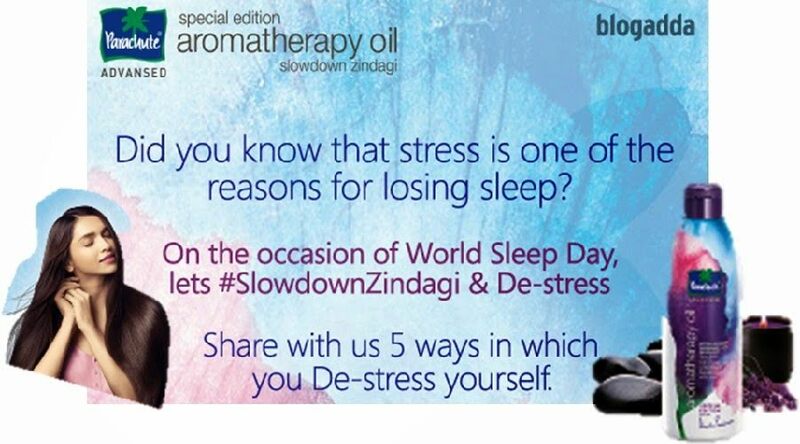 I am going to try a new quick way to de-stress soon and #SlowDownZindagi using Parachute Advansed Aromatherapy Oil. I'm sure you too have interesting ways to de-stress as well. I would love to know your tricks and guess what the most relevant best comment shall win a voucher from our sponsor.